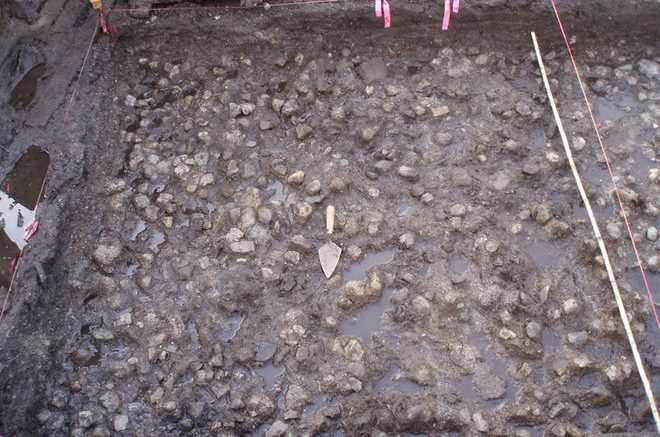 Archaeologists have found what may be the world’s oldest garden in British Columbia. The excavated garden consisted of 3,768 wapato tubers (Sagittaria latifolia), also called Indian potatoes, and was found on Katzie First Nation territory. It was found during a routine roadwork inspection. Radiocarbon dating from the wooden tools suggests that the garden is 3,800 years old, but was abandoned 3,200 years ago. The potato garden also appeared to use relatively advanced engineering techniques. A stone “pavement” was built in the garden by packing it with rocks. This had several advantages, as it allowed the gardeners to control how deep the potatoes would grow into the ground, and it also made it easier for the potatoes to be harvested. A stone wall was also built and relatively well-preserved. Wapato tubers grow in the swamp-like dirt under freshwater. The wall would have kept the potatoes uniform and easier to find, along with keeping the water in. These water-heavy conditions also created a good environment for preservation, which is why these potatoes did not disintegrate over thousands of years. The remains of the wapato tubers were blackened, but some were so well-preserved that some had managed to keep part of their starchy insides intact until now. Wapato tubers have a long history as a crucial part of First Nations diets. Some of the very first ethnographic accounts of the Pacific Northwest mention them, and while wapato was not a widely domesticated crop, they were a heavily traded food. Non-domestic plant management was a common source of food throughout history. Wapato tubers were typically harvested from October to February, and were an important source of carbohydrates during cold winters. Wapato tubers today are found along southern Canada and the United States.